To make this birthday hat cake, I used one 8 inch round pan for the bottom and the top is two 6 inch pans. This cake was chocolate on the large layer and chocolate and white on the top two layers. I filled them with almond buttercream and iced them first then put the fondant on the bottom and then on the top layers. I made some pink roses and green leaves with fondant. 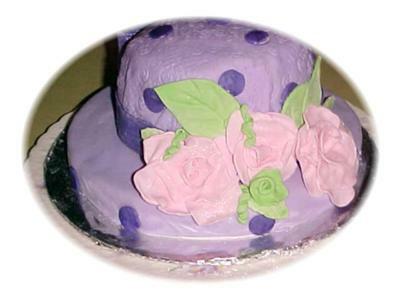 The back of the cake is a darker colored bow and roses on the front. Nancy, wonderful! I love it!!!!! Very pretty!!!! !